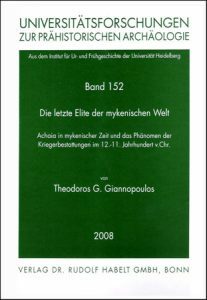 Die letzte Elite der mykenischen Welt. Achaia in mykenischer Zeit und das Phänomen der Kriegerbestattungen im 12. – 11. Jahrhundert v. Chr. Description: 1 vol., 288 p., 33 colour and b/w figures in the text, 3 plates, 79 colour and b/w plates, 29,7x21 cm. The Last Elite of the Mycenaean World. Achaea in the Mycenaean Age and the Phenomenon of Warrior Buri­als in the 12th-11th Century B.C. The aim of the present study is to examine the historical development of Achaea in the Mycenaean period, i.e. the landscape of the north-western Peloponnese that preserved in its place-name up to the present day the des­ignation of a much larger and much more important part of Late Bronze Age Greece. The book is divided into three parts. 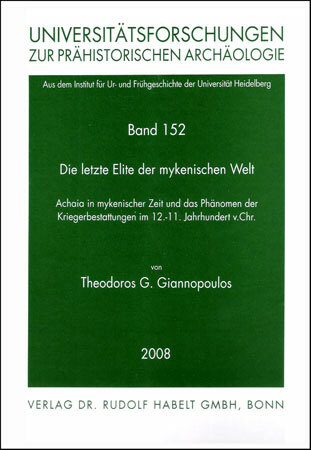 Τhe first part has been devoted to the de­tailed and sys­tematic overview of the natural environ­ment, the ancient sources, and the Mycenaean research history of Achaea. This is followed by a com­prehen­sive list of the hitherto exam­ined Mycenaean sites, as well as by a critical examination of the present state of re­search. The underlying goal is to provide the in­creasing number of scholars inter­ested in Achaea’ s prehistoric and particularly Mycenaean ar­chae­ology with a reliable starting point and a solid framework for further research. In the second part of this study the archaeological material from 18 Mycenaean chamber tombs is published. The material presented has been uncovered in four sites of central and western Achaea (Spaliareika Lousikon, Krini-Agios Konstantinos, Leontion-Vragianika and Monoden­dri). It consists of 71 completely preserved or restored ceramic vessels, 687 sherds, 27 metal objects and at least 350 small finds (cylinder seals, beads, stone tools and conuli). The most important part of this material consists of three warrior burials of LH IIIC date, two from chamber tomb 2 of Spa­liareika and the other from the warrior tomb of Krini-Agios Konstantinos. Their publication is the starting point for the detailed exami­nation of the phenomenon of LH IIIC warrior burials in Achaea, discussed in the third part of the book. For the pe­riod under consideration the grave findings discussed in the third part of the study represent the greatest concentration of warrior burials in the Aegean. Despite a lot of uncertainties associated with several of these warrior tombs due to the finding conditions, the insufficient documentation, or the state of publication, it is still possible to examine the main features of this ruling class which can be con­sidered as the last elite of the Mycenaean world. The examination includes the thorough discus­sion of all relevant finds with particular emphasis on the two warrior burials found in chamber tomb 2 of Spaliareika. Both these burials and the overall context of the tomb in which they were found offer valuable insights into the chronology as well as the social evolution and significance of LH IIIC Achaean warrior burials. In the course of the summarizing consideration of the phe­nomenon, the ar­chaeological evidence is evaluated from an interdisciplinary viewpoint also encom­passing some in­quiries related to the field of ancient history. As a result thereof, a coherent historical narrative of Achaea’ s development in the Late Bronze Age and especially in its lattermost phase (LH IIIC) is pro­vided. The general synthesis ends with the formulation of a new hypothesis concern­ing the associa­tion of the place-name “Achaea” with the north-western landscape of the Peloponnese.